This document was issued in New Bedford to the barque Vernon, which was under the command of Luther Little, Jr. The vessel was heading from New Bedford abd bound for the Pacific Ocean, with provisions and stores with utensils for a whaling voyage. The name Luther Little has a strong presence in American naval and maritime history. There was a naval captain Luther Little in the early United States Navy and a whaling captain Luther Little, who was master of the Grand Turk in 1836 and was probably the father of this Luther Little, Jr. In the 20th century there was a four-masted schooner launched in 1917 called the Luther Little. After a long career in the waning days of sail, she and the Hesper ended up as hulks in Wiscasset, Maine where they could be seen by generations of tourists travelling on Rt. 1. This sea letter was signed by President Millard Fillmore who as Vice President succeeded Taylor upon Taylor’s death. Fillmore served the remainer of the term from July 9, 1850 until March 4, 1853. As Vice-President he presided over the Senate’s debates on Henry Clay’s Compromise of 1850 bill to determine the extension of slavery into the newly acquired lands of the west. When he became President he demonstrated his alliance with the moderate Whig’s when he selected Daniel Webster as Secretary of State and he endorsed the Clay compromise, which became law. Daniel Webster is also a signer of this sea letter. He had served as Secretary of State nearly a decade earlier under President John Tyler. With Fillmore, Webster worked to pass the Compromise of 1850, which helped to keep the Union together. He created a controversy when he criticized European monarchism. He had other initiatives under way when he died in office in 1852. William T. Russell, the Collector of Customs in New Bedford, also signed the document. The Russells’ were another prominent family in New Bedford, and John T. Russell wrote a history of his family in 1844. John T. Russell severed as Collector for four years. The document was notarized by William H. Taylor who took an active part in the matters affecting public interests of New Bedford. Between 1832 and 1856, he served as alderman on the Board of Alderman. He served as Chief Engineer of the New Bedford Fire Department in 1844; was one of the charter members of the New Bedford Port Society for the moral improvement of seamen; Secretary of the same for many years and later served as its Vice President. He was instrumental in establishing the school system and one of the public schools in New Bedford carries his name to this day. 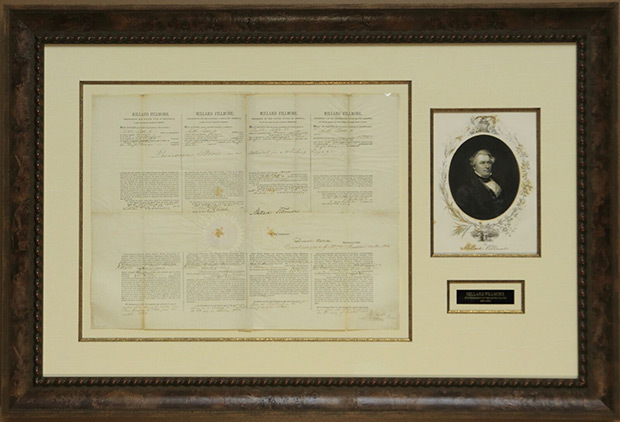 Incidental to this document is the fine cartouche that surrounds the image of Millard Fillmore that is framed with the sea letter. The small detail at the bottom of the image shows Commodore Perry landing in Japan with his Black Ships in the background. This was another accomplishment of the Fillmore era. This sea letter in printed on rag paper and bears the Great Seal of the United States in the center and the notary seal on the lower right.